Many folks don’t realize it, but Orlando is home to a number of local breweries that craft everything from dark stouts to lagers and pale ales. Each unique brew captures a different aspect of local brewmasters and are a must-try to get that full Florida experience on your next vacation. 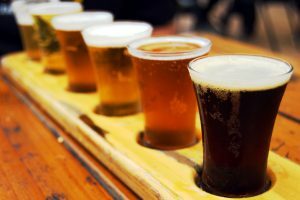 Below are some of our favorite local breweries in the Orlando area, each with their own uniquely formulated beers in-house. Located on Curry Ford Road just a short distance from downtown, Ocean Sun Brewery offers a variety of locally-made brews to suit any taste. The laid back environment make for a great evening. In addition to the local beer, the live entertainment is also always local, which gives customers the full Orlando experience. Just a short trip from downtown in the funky and culture-packed Mills 50 District, Ten10 Brewing offers patrons a sleek and modern take on the tasting room with only the most pure, locally sourced ingredients. In addition to beer, Ten10 offers wines that are aged and fermented in a local winery. Orlando Brewing sets itself apart from the competition by being the longest-standing organic microbrewery in the entire state. All of their beers are brewed under the stringent German Purity Law of 1516 and contain only four ingredients: water, hops, yeast, and malted barley. Orlando Brewing also offers tours of their facility Monday through Saturday at 6 p.m.
For those looking for a complete dining and brewery experience, Cask & Larder in the heart of Winter Park in East Orlando pairs the creations of top rated chefs with the beers from brew master Larry Foor. Each beer is brewed to pair perfectly with one of the offerings on the menu to make for a truly perfect dining experience. Explore the local flavors of Orlando at these breweries, but remember to always drink responsibly. Call a cab or use a ride-sharing app if necessary. The Rosen Inn is located on International Drive right in the heart of Orlando, so you’re never far from the action.